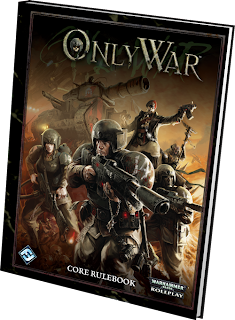 Andrew started out at FFG working on the Deathwatch line, but I would say he’s most well-known for designing Only War and Star Wars: Edge of the Empire. Andy is one of what I consider a small group of younger designers that have studied game design at a universities and have a unique perspective on the relatively venerable RPG industry. If you get a chance, definitely seek Andrew out at any of his convention appearances (such as PAX or Gen Con) and ask him about his philosophies on professionalism, systems design, and narrative. Now that he’s been introduced, let’s dive into the interview! As usual, all my questions are in red text. AF: Yeah! I am relatively new to the RPG industry, but I have been a gamer all my life. I am known among my friends as the guy who will play anything. I have a bookshelf overflowing with RPGs, a closet full of board games, multiple miniatures armies, countless decks of cards from different games, a gaming PC I built, and every video game console. My desire has always been to get a perspective on the design of games from every angle and approach. Each type of game can teach you something different about design, and I think that is important. 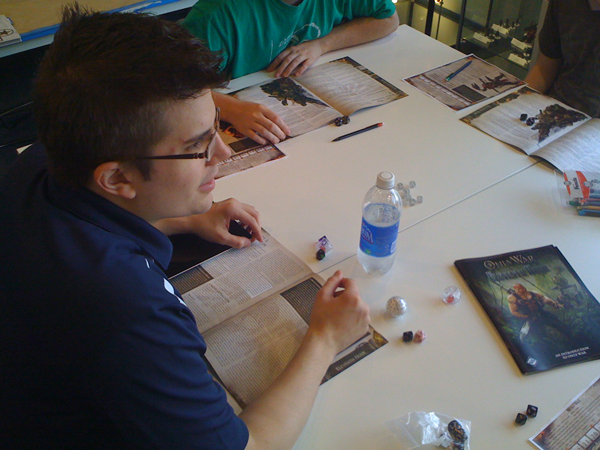 As a professional, I have been working at Fantasy Flight Games for just over three years. 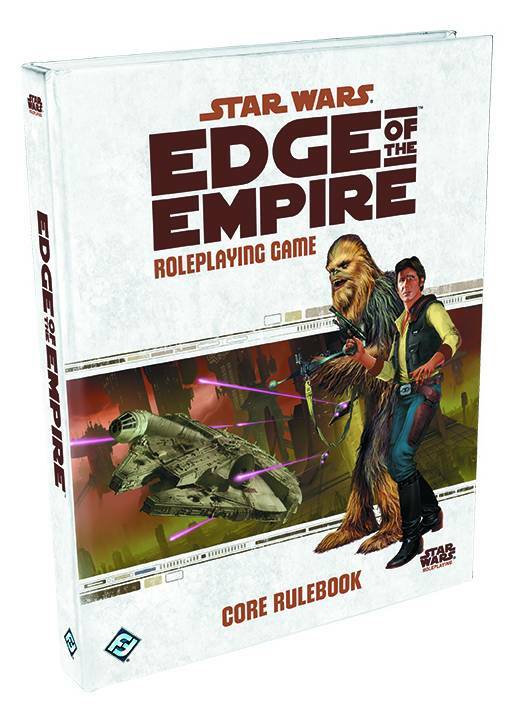 There I have worked on several tabletop RPG lines for both the Warhammer 40K and Star Wars licences. In my spare time, I am working on several indie games for PC and mobile platforms using the Unity game engine (although at this point that is more of a hobby). AF: Through a lot of hard work and no small amount of luck. I went to college for Computer Science, and then later Game Design. In my design classes I impressed a couple of my professors who had connections with Fantasy Flight. Through their recommendations I got a volunteer position as a playtesting coordinator. There, I impressed a couple FFG developers with my ability to manage teams and provide clear, concise design feedback. When a position opened up on the RPG team, they recommended me. The Imperial Guard has never looked so good! AF: There are many great things about working in this industry. If I had to choose one, I would say it’s the people. I get to collaborate every day with intelligent, creative people who challenge me and help me achieve things I may never have been able to on my own. When I go to the office, I get to work with people who are incredibly passionate about the same things I am, and are committed to working with me to make the best games possible. That is awesome. AF: It is a very competitive industry. To meet deadlines and produce quality projects requires a ton of hard work and long hours. I often run myself ragged getting my project where I want it to be before it heads off to printing. On top of that, it can be a very difficult industry to make a comfortable living in. AF: Well, I am pretty new to the industry, so 5 years ago I was on the outside looking in. I would say the biggest difference to me being on the inside now would be my perception of fan feedback vs sales. What I mean by this is that there can often be a huge difference between the internet’s perception of a product, and its actual success. The vocal minority on the internet can often be seen as the voice of the overall fanbase, either loving or hating certain games. Meanwhile, the actual sales and player numbers can paint a very different picture, with products the vocal few loved selling poorly, and products they hated selling well. This isn’t always the case, but it is very interesting to see the disparities that sometimes come up. This game was a bold step into the RPG legacy of Star Wars. AF: I do things differently on basically every project. Each project I do teaches me something I didn’t know before, and I evolve me process using this knowledge. There are countless things I have learned and changed from my first projects, but the biggest would probably be scheduling. Whenever I am scheduling out a task, I take the amount of time that task should take, and add %50. This is because nothing ever goes perfectly, and you have to integrate that into your plan. You have to be prepared for the bumps in the road so that when they come (and they will) they don’t adversely affect your project. AF: There are a lot of similarities between the ways freelancers and publishers should behave in regards to professionalism. Both should be punctual on everything including assignments, contracts, payments, and whatever else is involved in their work. Additionally, both should also be communicative – immediately and clearly communicating setbacks, changes, issues, or questions they have for the other party. For freelancers specifically, a very important aspect of working professionally is sticking to the assignment’s instructions. Your employer is paying you to render specific service. This isn’t a time to get creative and go off the rails (unless you’re being asked to!). This is a time for following instructions to a tee and delivering exactly what was asked for. For publishers specifically, it is very important to give immediate and clear feedback to your freelancers. They need to know what is good about their work and what needs improvement. If you do not communicate what you want from them or how you want them to change their work, they will not deliver. They can’t read your mind! AF: I feel like this is probably a pretty common answer to this, but: bringing more people into the community! I think the more we can do to make RPGs approachable and appealing to the general public, the better. This is a great hobby with fantastic storytelling and entertainment potential, we just need more people to share it with. AF: Well, that is harder when you are part of a larger company like Fantasy Flight Games, we have an entire department dedicated to interfacing with the community after all! But, despite that, I do what I can. Primarily I answer e-mails about the game lines, attend company events such as Star Wars XP, play games at local games stores, and go to industry trade shows. In fact, I will be or already have (depending on when you post this) participated in a panel at PAX Prime this year that I put together on Interactive Narrative. AF: This is a tricky one for me right now. 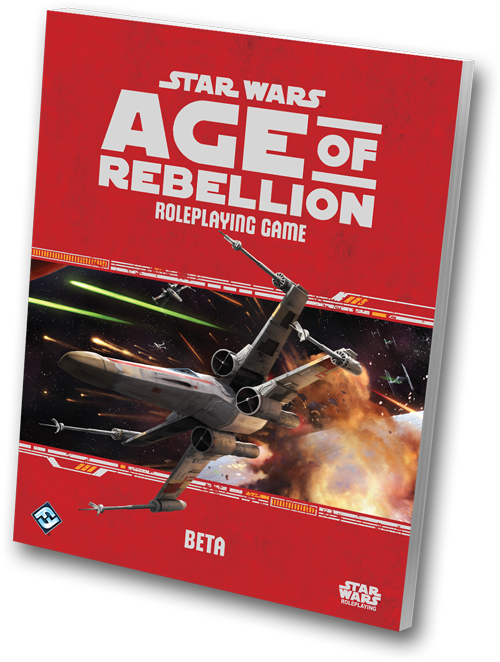 I am currently working on two very big projects: Age of Rebellion and Dark Heresy 2nd Edition. But I won’t list either of those games as my “greatest accomplishments” yet since I am still hard at work on them. Instead, I would have to say my biggest *finished* accomplishment at this point in my career is Only War. 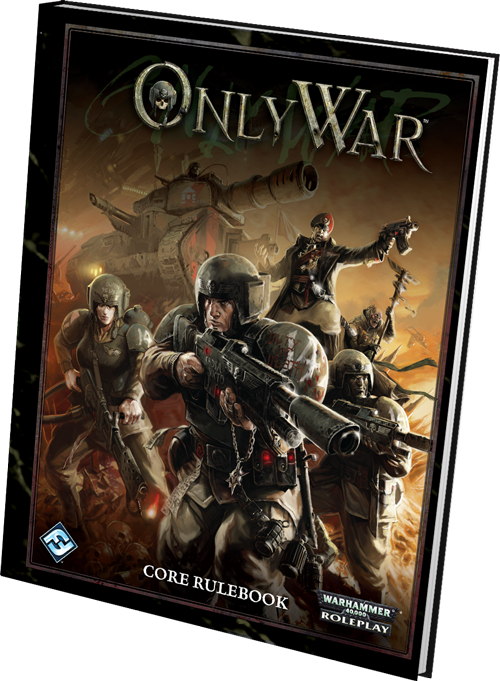 Only War is the Warhammer 40,000 RPG in which the players take on the roles of members of the Imperial Guard. I worked long hours designing this game, and I am very proud of the free-form advancement system that allows characters to grow in unique ways, the comrades system that give players another dimension to their character in combat, and the integrated vehicle rules that really up the stakes of the conflict. AF: Haha, that is a tricky question to answer. Not just in identifying my own failures, but in what I can and should (or shouldn’t) talk about. I am lucky enough to have had a pretty great career up until this point. I have constantly had the feeling of moving forward, and haven’t had too many major setbacks. 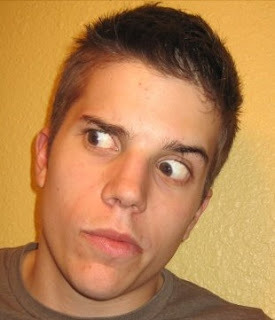 I think one of the hardest things when working for a large company is conflicts of vision. When working alongside many other creative professionals you are inevitably going to clash on some issues along the way. Usually you can work these things out, but sometimes you are going to disagree with the direction chosen. It is important to not only accept the decision, but embrace it, and that can be a challenge at times. This is Fish’s newest game — a Star Wars milestone! AF: I think creating a system that is fun and easy to deconstruct and houserule can often be just as important as any other aspect of the design. The easiest way to approach this from a systems perspective is to compartmentalize the design. This can be accomplished in a few different ways, but in general it means having the system broken into a series of distinct sub-systems that may not critically hinge on one-another. This way, the group can remove or replace certain sub-systems with their own creations without seriously disturbing the flow and balance of the rest of the system. In the end, the most important thing is making a system that is fun and balanced on its own. It is the GMs’ and players’ prerogative to to deconstruct any system you hand them, but it doesn’t need to be designed specifically for that purpose. That being said, it is always fun to create something that encourages that and see what awesome things people create. RW: If you were a fantasy adventurer, you’d be a…? AF: A twitchy half-elf mage, constantly analyzing the situation from the back of the group as I experiment with spell components… sometimes with dangerous side effects. …although looking over my shoulder while I’m writing this, my wife says I would be a human Paladin, inspiring and coordinating the party as we delve into our next adventure. It is interesting to see how you see yourself vs how other people see you. AF: “Favorite” can have so many different meanings. In another interview I did I answered this question with: I’d be lying if I didn’t say Dungeons and Dragons. That game (across multiple editions) not only defined a lot of my sensibilities, but the industry as a whole. I have played countless hours of D&D, and I love that game to death. Now, for another approach to “favorite,” I have a different answer when it comes to the games I respect the most for their new, creative approach to the genre and innovative design ideas. Of those I have many, but the one I have been having the most fun with lately is less of a traditional RPG, and more of a storytelling game: Fiasco. It has just enough of a system to put quirky and creative ideas in the heads of all the players and launch the session into a disastrous misadventure befitting the name of the game. AF: What do I look for from a totally random submission? Professionalism. I know that is a reeeeally broad answer, so let me specify. First off, have a cover letter and a resume. When you submit for a freelance position, you are submitting for a job, so take it seriously. Part of this is also having a clear, concise, and well-formatted e-mail. Two uncapitalized sentences with no introduction or information is not sufficient or appropriate. Second, make sure your writing sample is appropriate for the publisher you are submitting it to. If you are approaching an RPG company, rules and omniscient explanatory text would likely be the most appropriate. If you are approaching a novel publisher, then some fiction would likely be the best choice. Do your research, and know who you are submitting your work to. AF: Probably Monte Cook’s new game: Numenera. I got my Kickstarter PDF and read most of it over GenCon. It’s got this nice mix of modern, abstract, narrative mechanics and old-school RPG sensibilities that I think will create an interesting experience. It is also set in a killer, original setting that hits a lot of my favorite thematic elements in a world. I have been itching to give it a try, but with all my projects lately and multiple work playtest groups, I haven’t managed to get together my casual group of roleplayers in a while. RW: What is special about your approach to designing roleplaying games? AF: Well, I think everyone has their own, unique approach to design. The one thing I have noticed about my methods that is a bit unique, is my attention to detail, especially when it comes to numbers. I think this probably stems from my computer science background. When we are designing a lot of the top-level mechanics in a game system, I’ve noticed that many people I have worked with tend to go with their gut, designing what “feels” right to them. I on the other hand, tend to try to break down the statistics and probabilities of each new mechanic and analyse how it balances and synergizes with the other elements of the system. This is not to say that there is one “right” or “wrong” way to do things. I have seen amazing results from all sorts of different approaches. I have just noticed that the approach I take to this part of design is a bit more unique from the approaches I am used to seeing. Fish runs some new victims, er, players, through an Only War adventure. AF: For an RPG, the first things I usually define are the basic building blocks of a character, and how those are used to resolve tasks in an interesting way (the “core mechanic”). This mechanic is the engine that drives the game, and once this is defined, everything else is built around it. Once I have the core mechanic, I start looking at how that is used to perform all of the specific tasks that need to be accomplished while playing through the experience of the specific setting I’m working with. As these systems are added on, I watch out for two primary things in the way these new systems interact with the core mechanic and each other: parallelism and emergent behavior. Parallelism refers to any ways in which the multiple subsystems of the game can behave in the same way or follow the same rules. If a lot of your system uses similar mechanics and behaviors, it becomes much easier for new users to learn, and much more intuitive to for experience users to think about and optimize. The second thing – emergent behavior – is when two parts of a system interact in such a way that it creates new, complex behaviors that weren’t explicitly written into the rules. Emergent behavior can give your system depth and complexity while keeping the ruleset people need to learn simple. There are many other techniques and methods I use as I fill out the “meat” of the system, from running prototype playtests to creating decision-mapping spreadsheets. But the first step of defining the core mechanic and building the heart of the system around it, that is the most important part of creating a new system. Those mechanics are going to act as the foundation of the rest of the design, and so they deserve the most attention and work. If they work well, it will make the rest of the system that much easier to design.